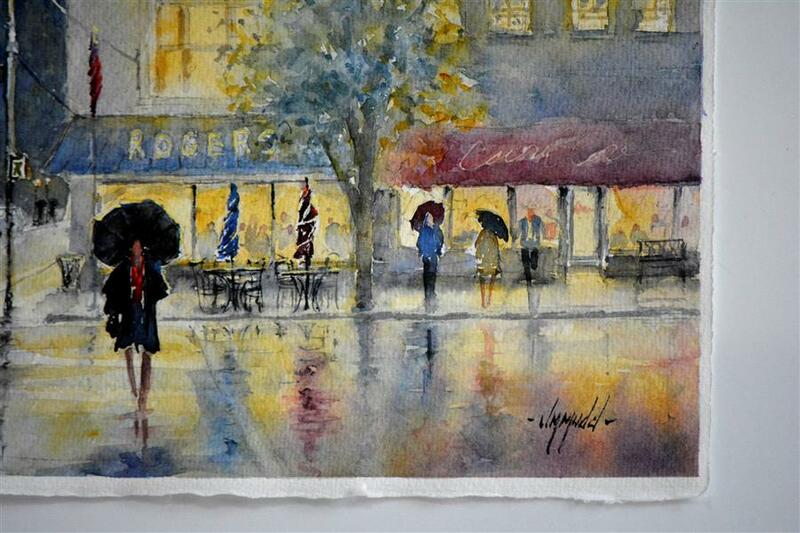 This piece is part of my "Rainy Day" series. 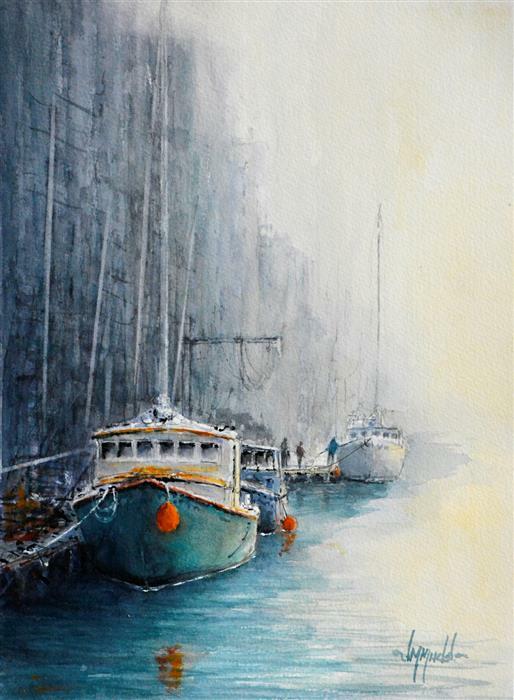 Watercolor is a perfect medium for this subject because of the watery effects it creates in paintings. It is painted with the finest professional materials available and will require framing for display. 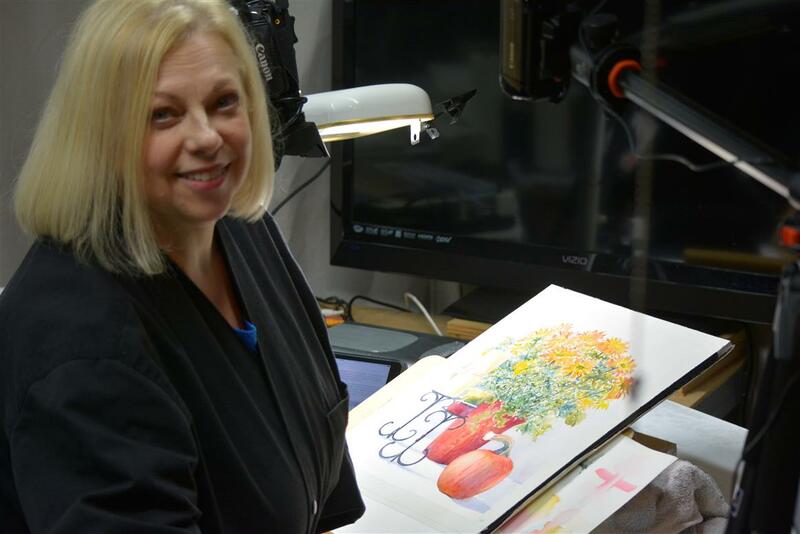 For Judy Mudd, creating a work of art means much more than simply reproducing something she sees. “It is more than painting a subject, it is expressing a feeling,” she explains. Judy develops her paintings with thorough reconnaissance work. She goes out on photo shoots in a variety of atmospheric conditions, sketches outdoors, takes notes, and completes color and value studies. 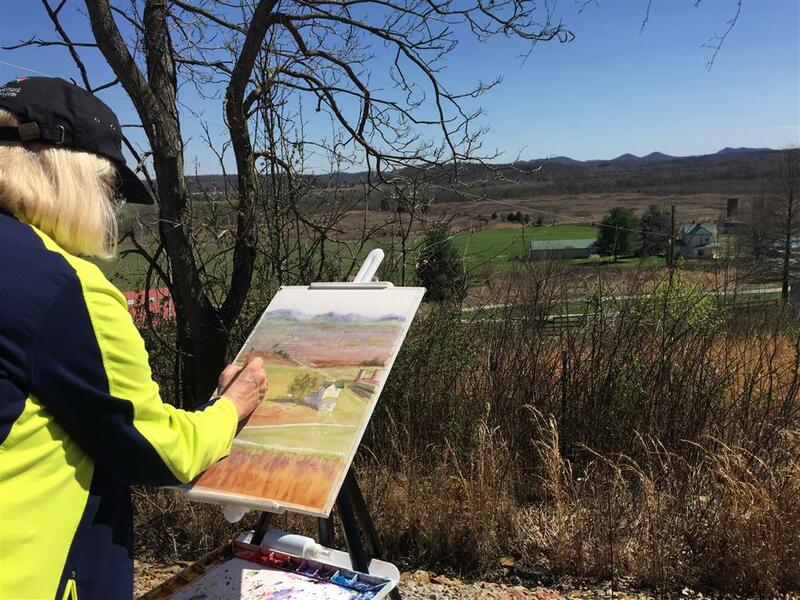 From there, back in the studio, she lets the paintbrush guide her. 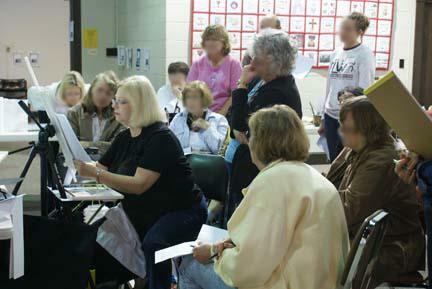 Outside of painting, Judy also leads watercolor workshops and runs a real estate business with her husband. 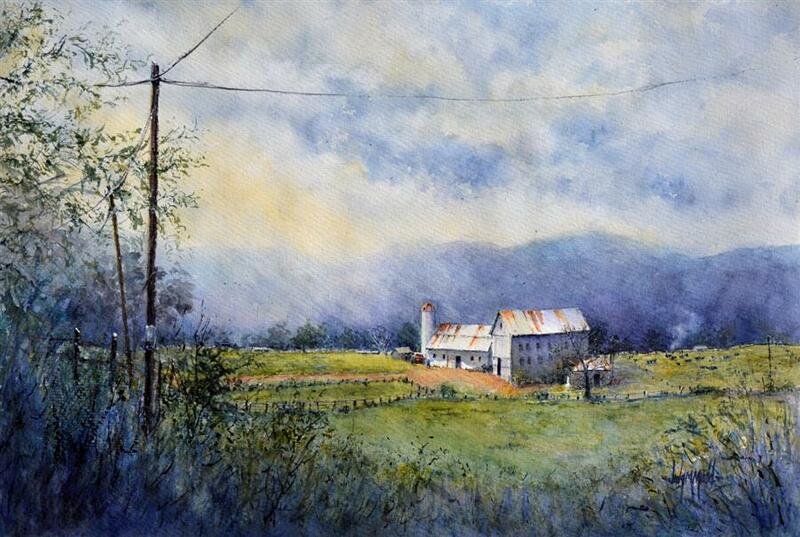 I have purchased three of Judy Mudd's watercolor paintings, and love each and every one. The first I purchased - Abandoned - hangs in my office and all who see it comment on how much they like it. Judy's diversity and ability to capture an essence - a feeling - in a painting sets her apart in my opinion. Thank you, Judy, for making my life a little brighter with your work! Thank you! I'm so happy you are pleased with your purchase. It is wonderful sharing my work with others and hearing back from clients means so much. I would love to see a photo of it in your Family Room! Thanks, again! I am so pleased with my new watercolor painting. It looks beautiful in my family room, where all can see, and enjoy, it. I am going to consider buying more of Judy Mudd's work. It would be an honor to have my words posted on your website. What wonderfully expressive writing! You honor me with your kind words. With your permission and credit, I would love to post it on my website. Thank you so much for purchasing my painting and I am thrilled you are enjoying it! "Chilly Commute" captures a time of day that I love—the golden hour just before sunset. It is this hour, with its Midas tendrils of evening light slanting through the gaps in the buildings and kissing everything it touches with luminescence, that shines out of the painting and fills me with longing to be in this very time and place. A place that feels both like a square here in my home town, but also like a square abroad, whispering its invitation across the gulf of my imagination. Beautifully done, Ms. Mudd. Thank you. Thank you for your comments Richard. Dampness was exactly what I intended along with the urban street reflections. So glad you feel the atmosphere of the painting and that it speaks to you. Thanks, again. 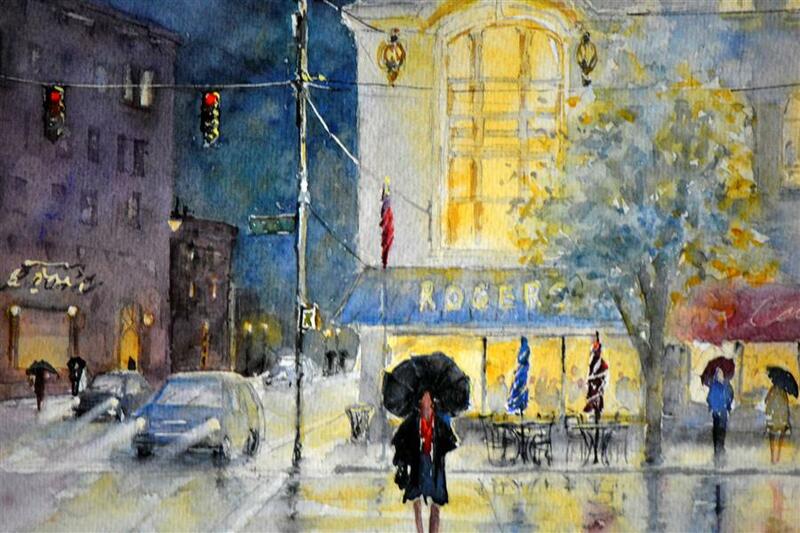 You feel the dampness coming through this watercolor. My East Coast roots were comfortably captured by Ms. Mudd. Thank you so much J Moynihan! The atmosphere and the feel of being there was what I had hoped to capture. Hearing that it connected with you and reminded you of home is wonderful to hear. I know the painting is in the right home. Thank you so much for purchasing it and letting me know how much it means to you. And, I agree, UGallery is excellent from both the purchaser and artist side of a fine art gallery. They have been fabulous to work with. Thanks, again and my very best to you! I am thrilled to have your painting, "Back Roads 2" in my home! I grew up in upstate NY, near the Finger Lakes, and this scene is reminiscent of the area. I summer in upper MI also full of interesting back roads. I love watercolors and your painting style. The painting will be a source of joy for many years to come. Also kudos to UGallery. I have never ordered art work online. I was impressed with the prompt delivery and excellent packaging and all-around professionalism. Thank you again, Judy, and continued success! Thank you Don. So glad you enjoy my paintings. Thank you for your kind words R. Colbeck! Yes, I love the old buildings and such, too. Lots of character which makes them enjoyable to paint. Occasionally I'll jump into acrylics or oils. Hardly ever pen and ink but I love their look, especially with watercolor. Thanks for taking the time to write and hope to talk with you again! Your water colors are great - I use pen and ink most of the time but some times I paint with acrylic. your (abandoned) is what I like, old buildings, barns, light houses, yesterday. I think your work is great, what more can I say?? Thank you so much L Deaville. As a fellow watercolorist, you know how difficult it is to retain those soft edges and atmosphere. Before you know it, a painting can get away from you! I enjoy painting portraits, too and in fact I teach watercolor portrait workshops along with atmospheric landscapes and others. Thank you so much for taking the time to comment on my paintings. It means so much to hear your kind words. 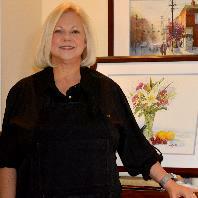 Hello Judy, I am watercolor painter specializing in portraits. I wanted to tell you I think your work is gorgeous - not too tight, your choice of pigments, and you have captured the light perfectly. Wonderful Crista! It thrills me to know you are happy with the painting. Thank you so much! 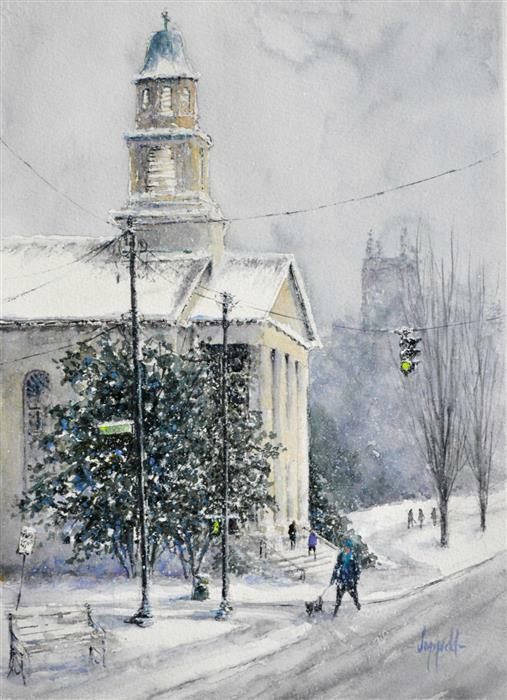 As a watercolor painter, I have great admiration for this exacting style. I wish I could detail like this. Very happy with my purchase! I paint in watercolors, oils and acrylics. I often marvel at the misconceptions regarding watercolor paints. Do you know they are all made with the same pigments? 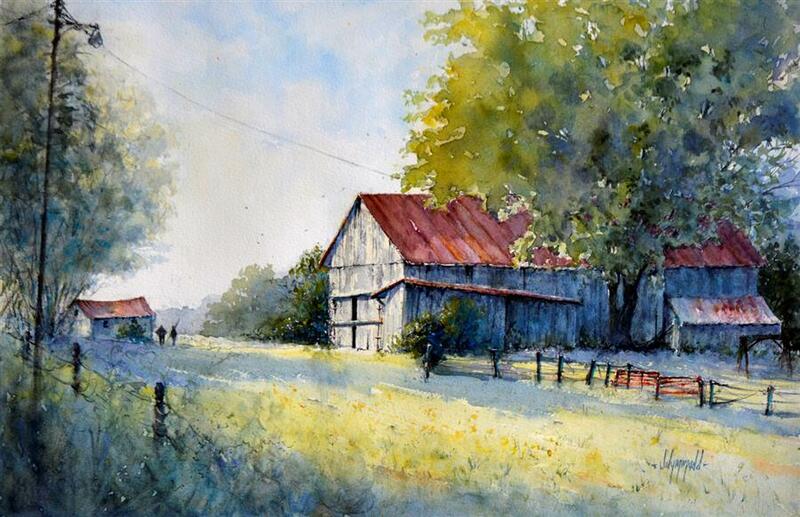 Watercolor paints are just as archival as any other medium. The pigments are suspended in gum arabic while oils pigments are in oil, acrylics are in...you get the picture. The pigments remain the same, it is the vehicle that determines how they are applied. 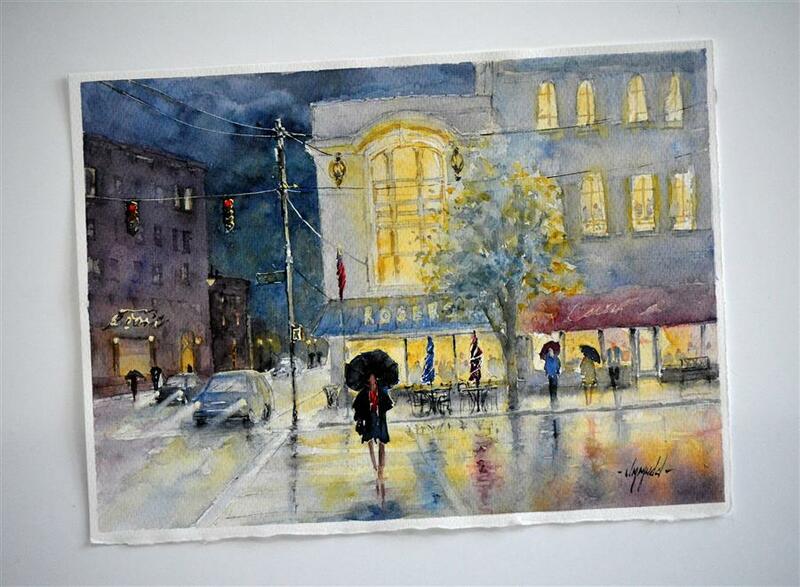 My painting,"Fourth and Broadway" has been accepted into the national show, Aqueous USA 2014 that will be held at Actor's Theater on Main St, Louisville, KY. The show opens Nov. 3rd and closes Dec.23rd. I always look forward to this show because of the outstanding artworks it brings to the area. What a nice surprise UGallery.com has been. I have been with them for three months and have already sold three paintings. Thank you to those that have invested in my artwork. I hope they bring you many, many years of pleasure!